J.Herbin struck gold -literally-, with Emerald Of Chivor, their most recent 1670 ink. The second I got a heads-up from mister Ed Jelley about this ink, I knew I had to have it. 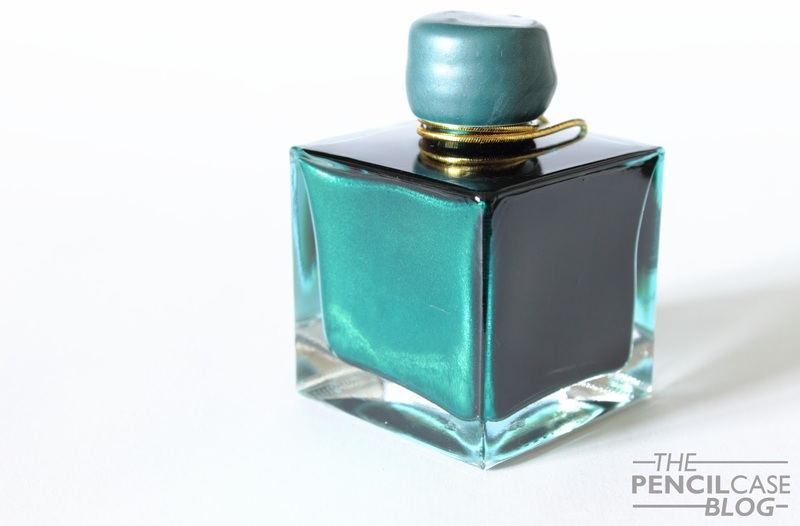 Emerald of Chivor is the fourth installment in J.Herbins 1670 ink collection. The previous three - while nice- never managed to make it into my ink collection. Either I already had too many inks within the same color range, or I was just sceptical about the gold flecks. However with Emerald, I ordered my bottle right away, and I'm really glad that I did! Even if Emerald of chivor didn't have those gold flecks, I'd still have no problem recommending it to anyone looking for a good ink. 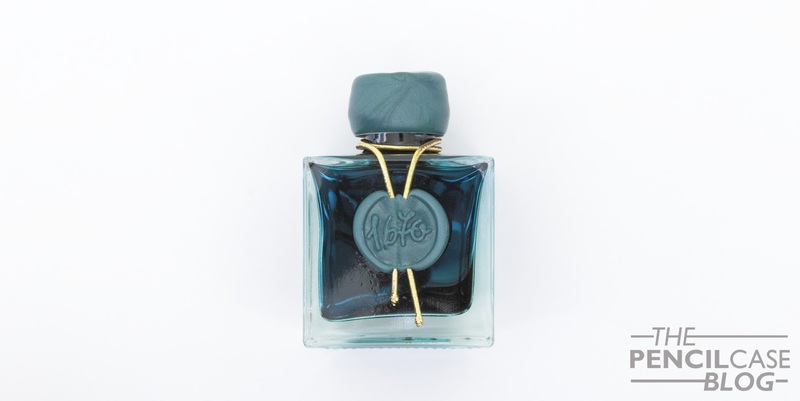 It's a quality ink in every way: well-behaved, well-lubricated, a nice color (lovely teal color), and lots of shading. Oh, and it has gold dust in it, but that's more of a bonus feature if you ask me. The gold particles make it fun to mess around with, and it looks cool when you use a demonstrator (Although I wouldn't necessarily recommend using it in anything more expensive than a TWSBI). It's rather subtle when you use it for normal writing in a fine or medium nib, and the glittery effect doesn't really show unless the light hits it in just the right way. For me personally, the gold particles are more of a gimmick. It makes it less usable in everyday situations; it's definitely more suited for creative applications than it is for normal writing. Another downside is that you should exert some caution when using an ink like this, or at least that's what it says on the box. In practice, I never really had any issues with my TWSBI mini during the three weeks I had it inked up. Nevertheless, I would suggest flushing your pen a bit more careful than usual when switching inks, and -as other bloggers already mentioned- give it a try in a pen that can be taken apart easily (just in case it gets clogged). It does look really neat in a demonstrator! 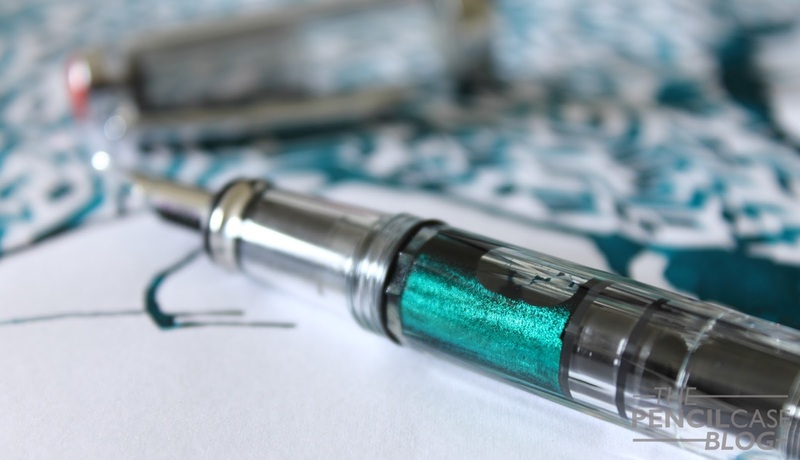 Are the gold flakes worth the premium price (16 EUR / 26 USD) you'll pay for Emerald Of Chivor? Not for me. Yet I'd immediately buy it again if I had to. However that would be because I really like the color, not just because it has gold dust in it. Note: La Couronne Du Comte Supports this blog. I received this product free of charge, so I could write this review. I was in no way influenced in the making of this review, the opinions shared here are completely my own! This review does not contain any affilate links.